Geographical distribution of K. hirsuta habitat. Sites marked with approximate latitudes. (Courtesy MBARI © 2005). 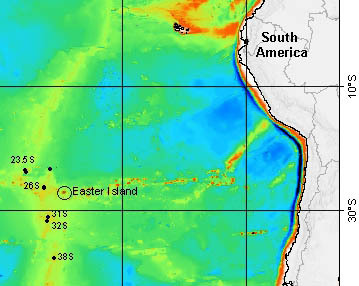 Specimens of the Yeti crab were first collected in March 2005 along a relatively short (1.5 km) stretch of ocean floor at approximately 37°50’S latitude (near the location marked 38S on the map at left). This region of the southeast Pacific Ocean near Easter Island is notable for its intense geothermal activity. More specifically, the species was found below 2228 meters water depth at three hydrothermal vent sites affectionately known by the colorful names Sebastian's Steamer, Pâle Étoile (French for "Pale Star"), and Annie’s Anthill (Macpherson, et al. 2005). To say that conditions surrounding hydrothermal vents are harsh would be a gross understatement. Superheated by subterranean magma, fiercely acidic, sulfide-rich currents—hostile to most forms of life—merge from hydrothermal vents at temperatures that can reach in excess of 400°C. At the depths in which K. hirsuta dwells, ambient pressures can reach 300 atmospheres. Here, sunlight is virtually nonexistent, rendering photosynthesis a nonviable means of food production, while little organic matte filters down so far from the surface, eliminating the possibility of relying upon detritivory as a primary means of sustenance (Koschinsky, et al. 2008). Yet these regions do in fact team with life. Extremophile species, some of whom survive in waters as hot as 100°C, have adapted to harness energy from hydrogen sulfide (H2S) instead of light--providing an abundant source of food for predators like K. hirsuta. Specimens of K. hirsuta were observed in situ not only on the relatively safe chimneys of extinct hydrothermal vents, but also in pillow basalt around active vents—and even at the bases of so-called black smokers (see video). Populations clusters were uniformly distributed with fewer than three individuals observed per 10 square-meter-area (Macpherson, et al. 2005).